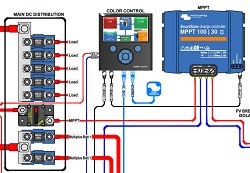 This post shows a wiring diagram prepared by Victron Energy showing in detail how some of their products connect together. I have annotated the drawing with notes and comments. Its a bit confusing that there are three different types of Victron 24 volt Lithium batteries and this article attempts to explain the difference between them. This is a link to two detailed articles that appered in the online magazine Truck Camper Adventure. Written by PKYS customer Pat Davitt they detail the ultimate electrical system he constructed for his Truck Camper Rig. He went with a pair of 24 Volt Victron HE Lithium batteries to make a system that runs on 48 volts. The articles give detailed wiring diagrams and specifications as well as background on why he selected the items he did. This is a sample labout prepared for a catamaran with a 24 volt electrical system.